Why? It’s the question that immediately jumps to mind before you even open the book. In The Man Who Broke into Auschwitz, one has to wonder why anyone would do such a thing. The answer may surprise you, but it’s just one part of this almost unbelievable true story. Young Denis Avey’s wartime adventures were plenty harrowing even before he got to Auschwitz. Having enlisted in the British Army in 1939 at the age of 20, he fought the Italians and the Germans in North Africa. Eventually taken prisoner by Rommel’s forces in Libya, he escaped when the cargo ship he was transported in was torpedoed by the British. Following his recapture in Greece, he was sent to the POW labor camp adjacent to the Auschwitz concentration camp. It was here, while being forced to work for the chemical giant IG Farben, that he first saw the throngs of emaciated Jewish prison laborers. Appalled by the deplorable conditions in which they were forced to work, Avey was able to befriend some of them. 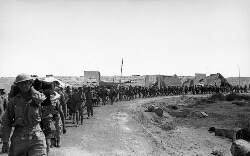 British POWs in Tobruk, Libya. Relaying his story 70 years after the fact – with the assistance of British journalist Rob Broomby – Avey goes on to tell how he risked his life to help save some of the Jews he met. On two occasions – as the book’s title indicates – he even swapped clothes with a Jewish prisoner to spend the night in the horrific conditions that were the Nazi concentration camps. 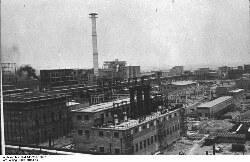 The IG Farben chemical plant in Auschwitz, Poland. Intriguingly, the author’s personal account of his dreadful descent into a real-life hell on earth reveals much about why he chose to risk his life in such a way. He also explains why it took so many decades for him to finally tell his story. Surprisingly, his cathartic account of the few years preceding publication in 2011 is one of the most emotionally charged parts of the book. Even though many years have passed, Avey is still able to effectively capture the horror of the experience, from the deplorable conditions – for both POWs and Jews – to the vile and inhuman behavior of the German guards that he witnessed every day. His heroic account reminds me of Louis Zamperini, the American POW whose story was told in Unbroken. It’s appalling to consider that there must be countless similar stories that never made it to the page. Revealed after seven decades, Avey’s personal chronicle is a remarkable read. 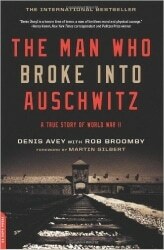 The Man Who Broke into Auschwitz is highly recommended for anyone interested in a unique perspective on the horrors of World War II and the Holocaust.